Happy Veterans Day! I'm so glad we designate a day specifically to remember veterans and thank them for their service to our country. 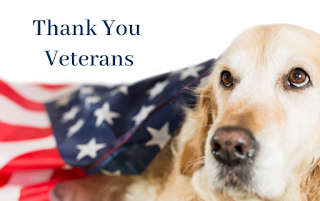 There will be events and ceremonies here in Laguna Beach which is wonderful and fitting, but, if you have the chance, it's also great to take the time to personally thank a veteran. Recently I had the opportunity to be involved in a fundraiser to help provide service dogs for veterans suffering from post-traumatic stress disorder. Such a worthy cause and I learned so much about the issues many of our heroes are dealing with and how effective those service dogs can be in the day to day battles and adjustments. Barking with the Stars was the perfect event to raise awareness and also raise some cash for the cause. So when things went awry, I knew we had to get things back on track. Fast. Before it all fell apart. But that was no easy task with temperamental stars and over zealous fans. Then things go from bad to worse when our celebrity headlines is found dead. As you can imagine, I can't help but want to help even if it puts me at odds with our local homicide detective. 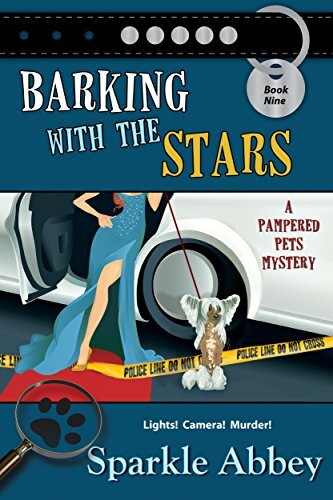 Barking with the Stars is the ninth book in Sparkle Abbey's Pampered Pets series. The series features Texas cousins Caro Lamont and Melinda Langston and they alternate the lead role from book to book. 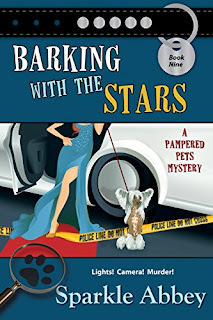 Barking with the Stars features pet therapist, Caro, and then, pet boutique owner, Mel, picks up the story in book ten, The Dogfather, which is the latest book in the series. Sparkle Abbey is the pseudonym of two mystery authors (Mary Lee Ashford and Anita Carter). They are friends and neighbors as well as co-writers of the Pampered Pets Mystery Series. The pen name was created by combining the names of their rescue pets—Sparkle (Mary Lee’s cat) and Abbey (Anita’s dog). They reside in the Midwest, but if they could write anywhere, you would find them on the beach with their laptops and, depending on the time of day, with either an iced tea or a margarita. Visit them at sparkleabbey.com.